Blue Hippo or commonly known as Regal Tang will never fail to amuse or entertain saltwater fish lovers with their agile and swift swimming style moving from one side of the aquarium to another. Being an active swimmer, they prefer large tank size to live in, which should measure at least 70 gallons and above so that they can reach maximum growing length of up to 10 inches. Blue hippo tang is commonly found off the waters located in the southern and western pacific, especially areas closer to the Great Barrier Reef in Australia. Identifying blue hippo tang should be relatively easy because the fish can be easily recognized by its flat body with overall wide front and then comes to narrow-ending shape at the tail end. The species comprises mainly of 3 different colors, which are marine blue, black and then yellow that appears only on the tail fin region. 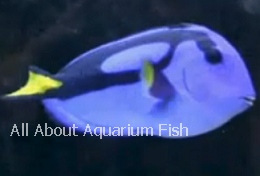 Just like other Surgeonfish family, the tail has a sharp end, which could easily inflict injury to the person handling the fish, and thus precaution must be taken while changing aquarium saltwater. Blue hippo tang requires moderate care and attention and generally it qualifies as one of the saltwater species recommended for intermediate level of experience required for aquarium hobbyist. They are naturally peaceful and will adapt well to any saltwater community tank often living in a group numbering from 2-4 of the same species. If you intend to introduce the fish to an established community aquarium, make sure that you buy your selection of blue hippo tang while they are still juvenile and add them together so that they can grow up in the same group. One of the common mistakes made by hobbyist is to purchase different types of adult blue hippo fish as pets and then introduce them together to the same confinement hoping that they will adapt to each other. What they do not realize is that adult fish can be harvested and captured from different places or region and thus these fishes will usually ended up fighting with each other. Buying juvenile blue hippo also has the advantage in the sense that they will easily adjust to any new tank environment and they will have fewer chances of being under stress and then developing aggressive behavior. Being a curious community fish, newly introduced blue hippo tang will take time to explore the whole tank and sometimes they love to find secluded spots among corals so that they can hide in it. Another thing to note also is that they belong to the groups of fish, which are strictly herbivorous, and thus their diet should comprise only of marine vegetable feed such as algae and seaweed. Apart from that, important things which you should also take note is that blue hippo can be susceptible to saltwater disease during the initial period when they are being introduced to the aquarium. Therefore, having basic aquarium medication in place can often save you a lot of trouble having to deal with problems later part to treat them and preventing the spread of saltwater fish disease. Related topics: Make sure you provide the best care for your precious pets by learning on how to identify symptoms of sick fish.